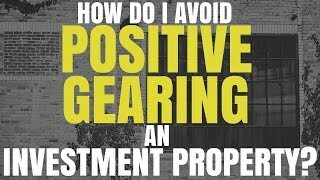 How do I avoid positive gearing my investment property? Why would you want to avoid positive gearing? Negative gearing exists and is popular because it allows you to save tax. You lose a dollar and you can claim whatever it is you pay in tax back. So if that’s 30% then you lose a dollar and you get thirty cents back. 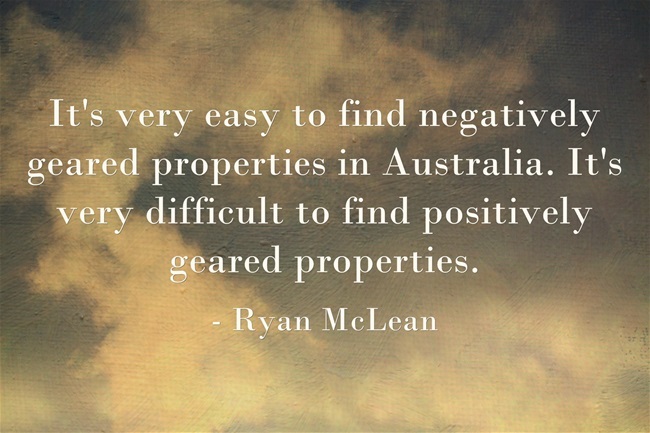 It’s very easy to find negatively geared properties in Australia. It’s very difficult to find positively geared properties. However it is likely that rents will go up over time but your major expense – your mortgage – will stay the same. So you may move from a negatively geared position to a positively geared position if you purchased a negatively geared property quite a while ago. It is a different situation if you’re earning a great amount of money – maybe over $180,000 a year – and you’re paying over 40% in tax and you still want to maximise those tax deductions. This could be when you would want to avoid positive gearing. So I will now show you two ways that you can avoid positive gearing your property portfolio. It still amazes me how few investors take advantage of depreciation. Depreciation includes the construction costs of the building as well as your internal fittings, curtains, carpets, floorboards, whitegoods and so forth. Getting a quantity surveyor into your property can allow you to take advantage of full depreciation in your property because they will help you to depreciate everything that you can. Renovations or new structures may help you to boost your depreciation. It will increase the value of the depreciable assets inside your property and increase your on-paper depreciation. And it may move you from a positively geared position to a negatively geared position on paper. Every month you still might be positively geared. But because you can claim thousands of dollars in depreciation you may be put into a negatively geared position at the end of the year. You may be able to maintain a negatively geared position if you continue to borrow to reinvest. Borrowing money to pay for holidays or borrowing against equity to buy your personal home is not going to be tax deductible. So technically you’re still going to be positively geared. But you could take money from your loan and use it for investment purposes. Let’s say you borrow $100,000 and you use that as a deposit on a new investment property. The interest on that $100,000 is going to be tax deductible. So you can leverage your existing equity to purchase more investment properties and that could bring you back to a negatively geared position. I would personally still prefer to be making money and paying tax than losing money and saving tax. But obviously everyone is in a different financial position and has different financial goals. So I hope that this has helped to answer the question: how do you avoid positive gearing. Until next time – stay positive.